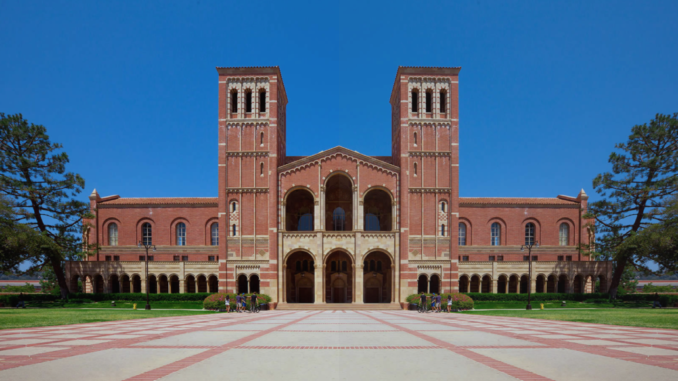 WESTWOOD – Campus tour guides were shocked last week when they reached the part of the tour at which they prompt guests to spot the differences between the two towers of Royce Hall because no discrepancies were to be found. “Us tour guides have absolutely nothing to say to visitors when we arrive at Royce now that the towers are symmetrical,” said Campus Tours representative Jessica Song while backpedaling to her apartment. “Whoever vandalized the towers was a total professional. Like, I thought it was hogwash, but when I looked at the two towers they were undoubtedly more even-–I guess one really was taller than the other. ” In the following days, a letter titled “A Blue Collar Manifesto: The Sham of Higher Education” was discovered taped to one of the Royce columns, detailing how the culprit plans to revert the Inverted Fountain.